Hi all! 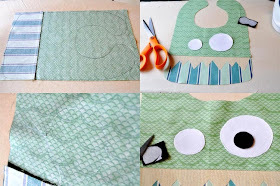 After the great response on my girly baby bib post I decided to make a tutorial for my newest bib design. The monster bib. I love how they turned out and hope you do too. Download and cut out your pattern. Overlap the top section of the bib on the dotted line of the bottom section of the bib and tape the two pieces together. Iron your fabrics. Cut your main fabric 12" x 10.5" and the fabric that will be below the teeth to 4" x 10.5". Trace the four circles (the eyes) and the teeth onto the smooth side of your Wonder Under. 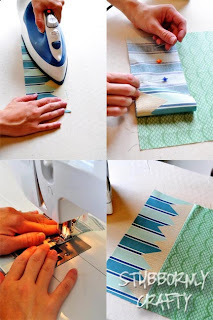 Cut around each piece of the Wonder Under leaving a little extra "negative space" and iron them rough side down onto your fabrics following the directions on the back of the package. If you are using felt like I did for the pupils, make sure you use a barrier between the iron and the felt (like a scrap of cotton fabric) or you can scorch the felt and cause it to melt. I've had a couple of readers mention they dislike applique and find it difficult to get the paper off. The Wonder Under can be a pain to work with. Here is what I've learned to make it a bit easier to get the backing off without causing the edges to fray. So, we left a bit of negative space before ironing the Wonder Under onto the fabric. Before you start to cut out around your shape, lift one side of the Wonder Under and peel it away from the fabric exposing the adhesive underneath. Set it back down and then cut around your shape. Now you already have an edge to help you pull off the backing without picking at the corner trying to get a start. You then rip it off fast like you would a band-aid. 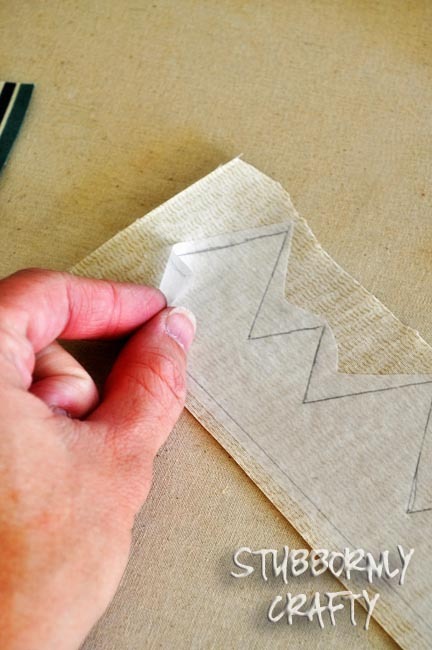 Place the teeth onto the top of your 4" x 10.5" piece of fabric and iron it down. Sew around the perimeter (I forgot this step until later). 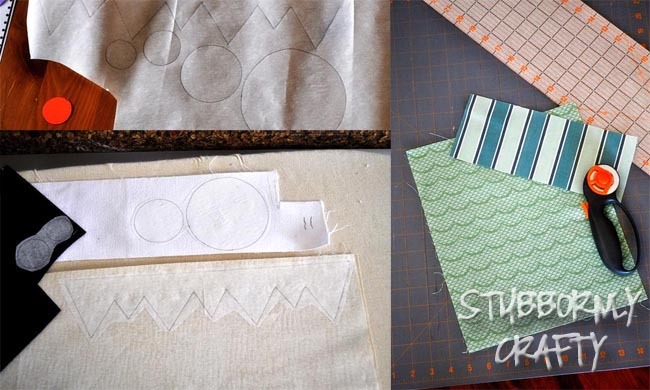 Layout your main fabric front (the 12" x 10.5") face up. Line up the mouth with your teeth closest to the bottom as shown above. Fabrics should be right sides together. With a 1/4-inch seam allowance, sew the two together and then press. Fold fabric right sides together in half longways. Line up the bib pattern on the inside crease and trace the bib onto the back (obviously, make sure to keep the teeth towards the bottom of the pattern). This will make placing the eyes in the correct position easier. Take the Wonder Under backing off the eyeballs, iron them down, and then sew around the perimeter. Repeat with the pupils. Instead of back-stitching, pull the front threads to the back and tie a knot. Now we are ready to assemble our bib. Trace and cut out your bib pattern on your batting and your fabric for the backing (in my case, this is minky). Sandwich them together as follows: on bottom your minky right side up, then your monster face right-side towards the minky, followed by your batting on top of that. If you are not using batting, it's just the two fabrics right-sides together. Pin them together and sew a 1/4-inch seam around the bib, leaving a small opening for turning at the bottom. Cut notches around your bib making sure not to cut your stitches. Then turn the bib right-side out using a chopstick or other blunt-tipped tool. 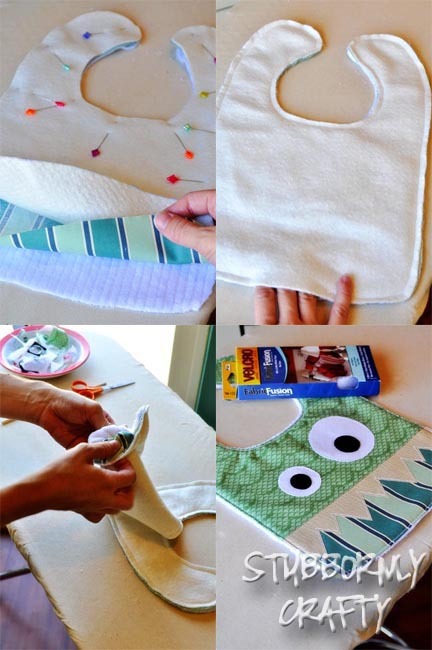 Iron your monster flat, folding in the fabric from your opening and pinning it to close it up. Top stitch around the edge of the entire bib to finish it off. Now all you have left to do is attach snaps or velcro and you're finished! Finished bib measures 8.5" wide by 13" tall. I think the one I made for the tutorial turned out looking more like a dragon. :) See how versatile this fabulous pattern is? these are so so so cute (three so:) thank you for sharing! they are going to make awesome gifts! 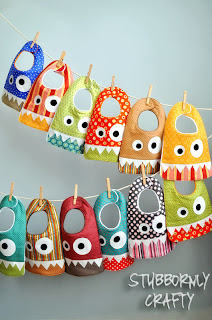 These are TOTALLY adorable --- I just saw them on Pinterest a minute ago and had to repin -- I need to make some of these cutie monsters for our g-niece and g-nephews! Can't wait to make one of these for my next baby shower gift. Thanks so much for sharing with us how to make it! So cute!!! What a fun idea!!! So cute! I can't wait to make a few. Thanks for sharing the tutorial. I love how you put the colorful fabric along the bottom. They are so fun! Visiting from delicate Contruction linky party. These are absolutely wonderful! Ahhhhh! They're so cute! Thanks so much for the great tutorial. 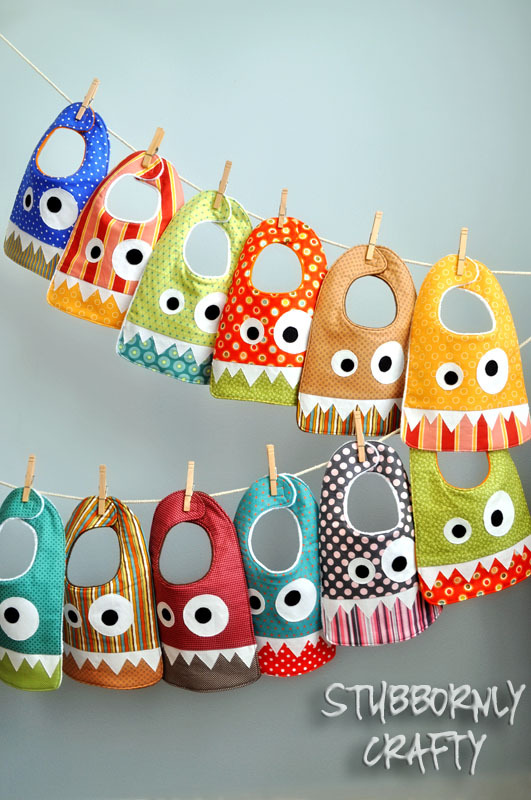 Such fun, colourful bibs!!! A very clever idea. I especially love the monster teeth. I would love for you to share these at our ongoing linky that's just for Baby Clothes and Accessories . So adorable! I really love these! I'm going to have to make some for my next baby shower present! These are so cute! I did a whole monster first birthday party for my son last April, and wish I had this idea!!! So cute - thanks for sharing! I couldn't resist - I made my first one today, lol. Easy peasy, and ever so cute! I posted it to my blog and linked back to you, Lisa - thank you for such a fun project! I already have another one cut out to make, lol! 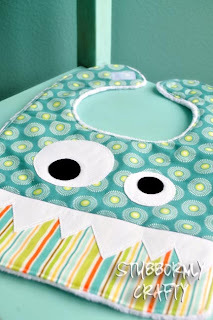 I think those are about the cutest bibs ever! I would love it if you shared this and any other idea you would like to link up to "One Creative Weekend" at OneCreativeMommy.com. These are so cute! I featured them on my blog last night. I absolutely LOVE this pattern. Thank you for sharing and thanks for linking up to our "Pretty Things" party! Hope to see you back here next week. OH MY GOSH that is so cool! Thanks a gazillion for sharing, I appreciate the time and effort that goes into creating free tutorials...you are amazing! I found you on Pinterest... I just adore your blog so I'm now stalking you! wow these are just so sweet!! Super cute! 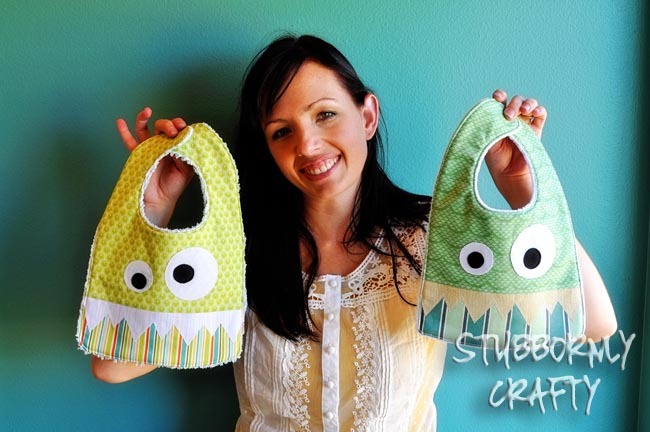 My bigs kids would love for me to make these for our newest little "monster". I love unique stuff, thanks for the tute! 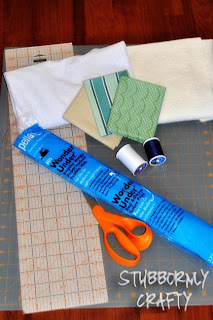 I found your blog via Craft o Maniac, and just started following! I would love it if you stopped by my brand new blog and if you feel so inclined, follow me too! http://feathersandsunshine.blogspot.com. Hope you have a great day! I love these. So cute. I've been trying to come up with something out of the ordinary for bibs, you've nailed it. Do you have any restrictions for selling items made from your tutorials? I had a look around on your blog for any wording of the sort, just thought I'd ask. Thanks heaps, I'll definitely be making some for my son. Hi Mandy! I should post my thoughts on selling items made from my tutorials on my tutorial page. I'll update that. As long as you are not copying and selling my patterns/tutorials I'd be happy for you to use my patterns to create items for resell. Just please give me credit for the pattern itself. Thanks for asking, commenting, and stopping on by! Lisa, This is SO cute! My daughters BF from high school is expecting a baby boy..guess I better get started on a few of these! just a quick tip on getting the paper off paper backed fusibles. When you have let your piece cool, and have trimmed to the size you want, take a straight pin and run a score line someplace in the middle of your piece(on the paper side). This will just give you a line to start with. If you cannot find the line, bend the piece right at the line and it will gap a bit, giving you a starting place. (took me YEARS to figure this out..but boy it helps!) Thanks for the cute pattern! These are absolutely adorable! Love those teeth! Thanks for linking them up to Gettin'Krafty With It! Lisa!!! They are AMAZING!!!!!! Soooo cool!!! No way! How cute are these?! I am loving it! I'd love for you to come share this at our Pinteresting Party! Thank you for linking these to my party! I featured them in my weekly spotlight. Happy Crafting! Precious! Saw these at the Happy Hour link up, love how cute they are!! Those are hilarious and adorable!!! Love 'em! Pinned 'em!! Thanks for sharing these! You'll be featured this week on Bear Rabbit Bear Craft's Things to Make This Weekend! These are so stinkin' cute. I have to share with my daughter as she is having a boy in November. Thanks for sharing at Totally Transformed Tuesday. SERIOUSLY and I mean SERIOUSLY darling - I'm sooooo gonna make this next time I need a baby present idea! thanks for the wonderful inspiration! So cute! My little boy may just need these. Love them! These are so stinkin' cute! And just in time for my son. Thank you! Super original et merci pour le patron et le tuto ! 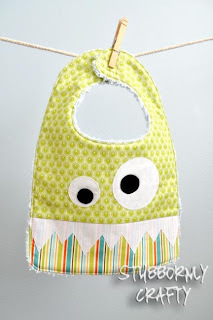 I had so much fun making these today and some girly bibs too! Thanks for the great idea, I've never completed a sewing project without my mom's help-lame I know! But your tutorial led me to independence in sewing! Thanks! Thanks for the fun pattern! Cute bibs. Thanks for sharing your creativity. Love them...made them...thanks for sharing. 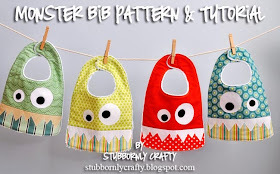 Evening there, Your bib idea is awesome and as I have started blogging again I've blogged about it. So cute!! Thanks for sharing. I'm going to make these for my new grandbabies on the way!! These are adorable! I would love to make a couple for my little guy, but I'm having trouble downloading the pattern! :( It comes up with a dropbox error message. Hi for some reason the pattern download wont work for me :( and they are so cute i need to make them!! Argh, Drop Box was down yesterday for a bit too. So sorry. It's working on my end so maybe try it again. If that doesn't work shoot me an e-mail @ lisasummerhays(at)gmail(dot)com and I'll send them directly to you. These monsters are so lovely! Thank you! Realliy beautiful DIY project. Love it.